As of this writing, we hit with the 2017 DeMarini Voodoo Balanced in both BBCOR and big barrel sizing and gathered feedback from several different hitters. 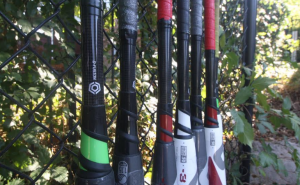 We also spent considerable time reviewing previous versions of the Voodoo and NVS Vexxum, which are, we argue, predecessors to the DeMarini Voodoo Balanced. Added to our extensive knowledge of performance baseball bats and the several hundred reviews we’ve written on this site collectively, this 2017 Voodoo DeMarini Voodoo Balanced review comes on the heels of thousands of hours of research and testing. If you are buying, we’d at least do a price check search like this on Amazon of the Voodoo Balanced. The drop 9, 2 5/8 comes in lime green accents and looks a lot like the drop 5 2 5/8, but it isn’t. (Price Check). The 2017 Voodoo Balance will also come in a 2 3/4 drop 10. We suspect this may be the most popular of the big barrel versions. (Price Check). A Junior Big Barrel version of the 2017 Voodoo Balance is also released. Do note, however, this bat is not a traditional two piece but, instead, a one piece design. The JBB Voodoo Balance takes the same alloy in the barrels of the 2017 Voodoo (called X14) and extends it through the handle as well. These bats are not rated for pitch speeds above 45mph, but, we’d guess, this little guy could take it. This bat only comes in very short sizes: 25, 26 and 27 inch lengths. This bat, we’d argue, should really be called the JBB Voodoo One Balanced. (Price Check). A drop 13 2 1/4 Youth Barrel bat will also release for the 2017 Voodoo Balance. The racing stripe and design are burnt orange. (Price Check). There is a considerable difference between the 2017 Voodoo Balance and the 2016 Voodoo Raw. Namely, the swing weight on the balance is much lower (nearly 15% by our measurements) than the Voodoo Raw of 2016. This is different enough to put the Voodoo Balance in a different category than the Voodoo Raw. Instead, we like to think of the Voodoo Balance as the next generation of the 2016 DeMarini NVS Vexxum. The Vexxum is a two piece hybrid with a more balanced swing than the Voodoo Raw. The Vexxum, however, was always a step or two behind the Voodoo technology in terms of barrel size, alloy and handle composition. As such, the Balance has considerable upgrades to the handle and alloy barrel if compared directly to the 2016 Vexxum. Both upgraded features contribute to a much longer and more usable barrel. A light swinging two piece hybrid bat in the performance space is a small category of bats. However, there is some legit competition if you find yourself in this exact market. Easton would claim, and so would we, the 2017 Z-Core Hybrid is a comparable bat in terms of barrel size, swing weight and composition. The Z-Core’s barrel is a bit larger than the Voodoo Balance. On the other hand, you simply can’t overlook the successful pedigree of the Voodoo line. Another comparable bat is the 2016 Louisville Slugger 716 Select. This two piece hybrid is also a light swinging bat with a well performing barrel used at all levels of the sport. Those who like hot out of the wrapper performance in the collegiate ranks gravitate to this bat. From what we have gathered, the 716 will not be produced in a 2017 model. 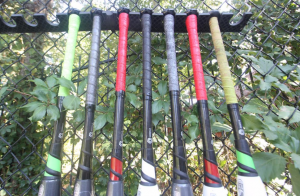 We can only guess, but the acquisition of Slugger by Wilson, who also owns DeMarini, might have something to do with a Voodoo Balance release and the lack of a 2017 717 from Louisville Slugger. We spent at least a little bit of time at each of the following resources to compile the above notes. We suspect you may also find them helpful.